The construction of the Glen Canyon Dam on the Colorado River in the late 1950s opened the door to new opportunities in the U.S. Southwest at the same time that it closed the door on others. 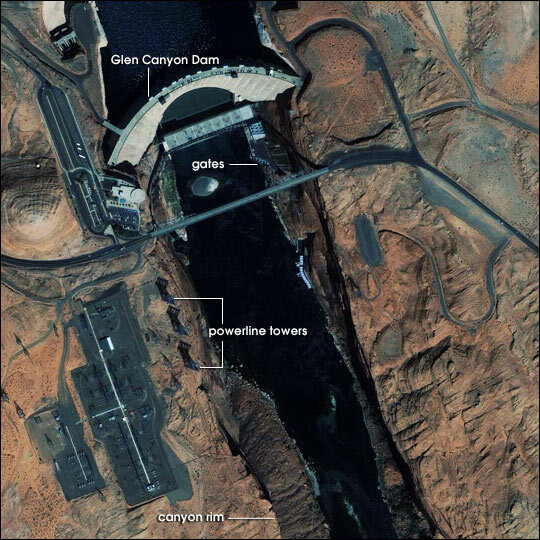 The dam, Lake Powell (the reservoir created upstream), and a short section of the river downstream are pictured in this image captured by the Ikonos satellite on September 21, 2004. Located near the state line between Utah in the north and Arizona to the south, the Glen Canyon Dam is part of the water management system that transforms the Colorado’s yearly flow from a once-a-year “blow out” of unpredictable volume (fueled by snowmelt and spring storms) to a regular and reliable source of water for people as far away as California. The water management strategy created opportunities for millions of people to live, work, and farm in arid or semi-arid areas that wouldn't otherwise be hospitable. The dam also generates hydroelectric power. 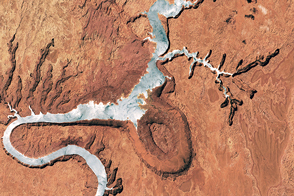 When the dam was complete and Lake Powell began to fill upstream, other possibilities were lost. Possibilities for another generation of people to explore and enjoy the history, scenery, geology, and archeology of Glen Canyon and the dozens of side canyons in their natural state disappeared. The elimination of the yearly flood produced another kind of loss downstream in the Grand Canyon. Beaches and sandbars created and renewed each year by the sediments carried in the spring-summer floods began to decline. Several of the Grand Canyon’s unique fish species, which depended on those habitats for food and spawning, went extinct; most of those that remain are in various stages of decline. This image was captured about a month before water managers opened wide the dam’s gates and allowed the water to roar through the canyon in an effort to mimic—on a smaller scale—the natural processes that sustained the delicate ecosystems of the Grand Canyon. The first large-scale, planned flood of the Grand Canyon happened in spring 1996, but was not as successful as scientists hoped. Based on what they learned in that event, scientists adjusted the timing and volume of water for the November release. The planned flood, which began on November 21, lasted about 90 hours. Image by Kerri Rose, based on data copyrighted by DigitalGlobe.